Previous Versions in Windows Vista, a part of Windows Explorer that allows persistent shadow copies to be created. Shadow Copy (also known as Volume Snapshot Service, Volume Shadow Copy Service or VSS) is a technology included in Microsoft Windows that allows taking manual or automatic backup copies or snapshots of computer files or volumes, even when they are in use. It is implemented as a Windows service called the Volume Shadow Copy service. A software VSS provider service is also included as part of Windows to be used by Windows applications. Shadow Copy technology requires the file system to be NTFS in order to create and store shadow copies. Shadow Copies can be created on local and external (removable or network) volumes by any Windows component that uses this technology, such as when creating a scheduled Windows Backup or automatic System Restore point. VSS operates at the block level of volumes. A snapshot is a read-only point-in-time copy of the volume. Snapshots allow the creation of consistent backups of a volume, ensuring that the contents do not change and are not locked while the backup is being made. The core component of shadow copy is the Volume Shadow Copy service, which initiates and oversees the snapshot creation process. The components that perform all the necessary data transfer are called providers. While Windows comes with a default System Provider, software and hardware vendors can create their own software or hardware providers and register them with Volume Shadow Copy service. Each provider has a maximum of 10 seconds' time to complete the snapshot generation. Other components that are involved in the snapshot creation process are writers. The aim of Shadow Copy is to create consistent reliable snapshots. But sometimes, this cannot simply be achieved by completing all pending file change operations. Sometimes, it is necessary to complete a series of inter-related changes to several related files. For example, when a database application transfers a piece of data from one file to another, it needs to delete it from the source file and create it in the destination file. Hence, a snapshot must not be between the first deletion and the subsequent creation, or else it is worthless; it must either be before the deletion or after the creation. Enforcing this semantic consistency is the duty of writers. Each writer is application-specific and has 60 seconds to establish a backup-safe state before providers start snapshot creation. If the Volume Shadow Copy service does not receive acknowledgement of success from the corresponding writers within this time-frame, it fails the operation. Windows software and services that support VSS include Windows Failover Cluster, Windows Backup, Hyper-V, Virtual Server, Active Directory, SQL Server, Exchange Server and SharePoint. The end result is similar to a versioning file system, allowing any file to be retrieved as it existed at the time any of the snapshots was made. Unlike a true versioning file system, however, users cannot trigger the creation of new versions of an individual file, only the entire volume. As a side-effect, whereas the owner of a file can create new versions in a versioning file system, only a system administrator or a backup operator can create new snapshots (or control when new snapshots are taken), because this requires control of the entire volume rather than an individual file. Also, many versioning file systems (such as the one in VMS) implicitly save a version of files each time they are changed; systems using a snapshotting approach like Windows only capture the state periodically. Volume Snapshot Service was first added to Microsoft Windows in Windows XP. It can only create temporary snapshots, used for accessing stable on-disk version of files that are opened for editing (and therefore locked). This version of VSS is used by NTBackup. The creation of persistent snapshots (which remain available across reboots until specifically deleted) has been added in Windows Server 2003, allowing up to 512 snapshots to exist simultaneously for the same volume. In Windows Server 2003, VSS is used to create incremental periodic snapshots of data of changed files over time. A maximum of 64 snapshots are stored on the server and are accessible to clients over the network. This feature is known as Shadow Copies for Shared Folders and is designed for a client–server model. Its client component is included with Windows XP SP2 or later, and is available for installation on Windows 2000 SP3 or later, as well as Windows XP RTM or SP1. Windows XP and later include a command line utility called vssadmin that can list, create or delete volume shadow copies and list installed shadow copy writers and providers. Microsoft updated a number of Windows components to make use of Shadow Copy. Backup and Restore in Windows Vista, Windows Server 2008, Windows 7 and Windows Server 2008 R2 use shadow copies of files in both file-based and sector-by-sector backup. The System Protection component uses VSS when creating and maintaining periodic copies of system and user data on the same local volume (similar to the Shadow Copies for Shared Folders feature in Windows Server); VSS allows such data to be locally accessed by System Restore. System Restore allows reverting to an entire previous set of shadow copies called a restore point. Prior to Windows Vista, System Restore depended on a file-based filter that watched changes for a certain set of file extensions, and then copied files before they were overwritten. In addition, a part of Windows Explorer called Previous Versions allows restoring individual files or folders locally from restore points as they existed at the time of the snapshot, thus retrieving an earlier version of a file or recovering a file deleted by mistake. Finally, Windows Server 2008 introduces the diskshadow utility which exposes VSS functionality through 20 different commands. The system creates shadow copies automatically once per day, or when triggered by the backup utility or installer applications which create a restore point. The "Previous Versions" feature is available in the Business, Enterprise, and Ultimate editions of Windows Vista and in all Windows 7 editions. The Home Editions of Vista lack the "Previous Versions" feature, even though the Volume Snapshot Service is included and running. Using third-party tools it is still possible to restore previous versions of files on the local volume. Some of these tools also allow users to schedule snapshots at user-defined intervals, configure the storage used by volume-shadow copies and compare files or directories from different points-in-time using snapshots. Windows 7 also adds native support through a GUI to configure the storage used by volume-shadow copies. 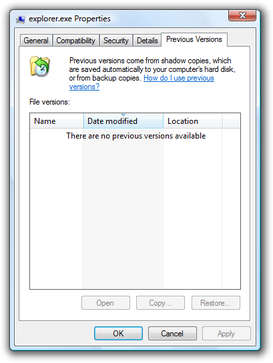 While supporting persistent shadow copies, Windows 8 lacks the GUI portion necessary to browse them; therefore the ability to browse, search or recover older versions of files via the Previous Versions tab of the Properties dialog of files was removed for local volumes. However, using third party tools (such as ShadowExplorer) it is possible to recover that functionality. The feature is fully available in Windows Server 2012. Samba on Linux is capable of providing Shadow Copy Service on an LVM-backed storage or with an underlying ZFS or btrfs. While the different NTFS versions have a certain degree of both forward and backward compatibility, there are certain issues when mounting newer NTFS volumes containing persistent shadow copies in older versions of Windows. This affects dual-booting, and external portable hard drives. Specifically, the persistent shadow copies created by Windows Vista on an NTFS volume are deleted when Windows XP or Windows Server 2003 mount that NTFS volume. This happens because the older operating system does not understand the newer format of persistent shadow copies. Likewise, System Restore snapshots created by Windows 8 are deleted if they are exposed to a previous version of Windows. ^ a b "Volume Snapshot Service (VSS)". Glossary. Symantec. Retrieved 2 May 2013. ^ a b c d "Volume Shadow Copy Service Overview". MSDN Library. Microsoft. 5 November 2012. Retrieved 2 May 2013. ^ a b "How Volume Shadow Copy Service Works". TechNet. Microsoft. 28 March 2003. Retrieved 4 January 2011. ^ Archiveddocs. "What's New in Failover Clusters in Windows Server 2008". technet.microsoft.com. Retrieved 18 March 2018. ^ "Shadow Copy Client Download". TechNet. Microsoft. Retrieved 21 October 2014. ^ Oltean, Adi (17 December 2004). "Tips for deploying Shadow copies [sic] for Shared Folders". Antimail. Microsoft. Retrieved 21 April 2009. ^ "Windows XP - Volume Shadow Copy Service". MSDN. Microsoft. Retrieved 31 May 2013. ^ "Vssadmin". Windows Server 2008 and Windows Server 2008 R2 documentations. TechNet Library. Microsoft. 28 September 2007. Windows Server Commands, References, and Tools. Retrieved 27 March 2012. ^ Compare: "Information about SPP folder in Windows vista". Microsoft Community. Microsoft. 20 August 2010. Retrieved 22 July 2015. SPP stand for Shared Protection Point and is used by windows to store information on restore point. ^ Compare: Barreto, Jose (16 September 2009). "Diagnosing Failures in Windows Server Backup – Part 1 (VSS/SPP Errors)". Storage at Microsoft: The official blog of the Windows and Windows Server storage engineering teams. Microsoft Corporation. Retrieved 11 September 2017. [...] the origin of the error is in an underlying layer such as Volume Shadow Copy Service (VSS), Shared Protection Point (SPP), or other applications that plug into VSS framework. ^ Russinovich, Mark E.; Solomon, David A. (2005). Microsoft Windows Internals: Microsoft Windows Server 2003, Windows XP, and Windows 2000 (4 ed.). Redmond, WA: Microsoft Press. pp. 706–711. ISBN 0-7356-1917-4. ^ "Windows Backup". Windows Vista portal. Microsoft. Archived from the original on 10 May 2007. Retrieved 11 January 2014. ^ Fok, Christine (September 2007). "A Guide to Windows Vista Backup Technologies". TechNet Magazine. Microsoft. Retrieved 11 January 2014. ^ "Diskshadow". Windows Server 2008 and Windows Server 2008 R2 documentations. TechNet Library. Microsoft Corporation. 28 September 2007. Windows Server Commands, References, and Tools. Retrieved 27 March 2012. ^ "Selected Scenarios for Maintaining Data Integrity with Windows Vista". TechNet. Microsoft Corporation. ^ "A Guide to Windows Vista Backup Technologies". Microsoft. ^ "Volume Shadow Copy and "Previous Versions" feature in Windows Vista". Microsoft Corporation. ^ "Previous versions UI removed for local volumes (Windows)". Retrieved 17 November 2012. ^ "Bad User Agent detected". www.winhelp.us. Retrieved 18 March 2018. ^ "Samba HOWTO Collection, Part III. Advanced Configuration". Retrieved 2 October 2012. ^ "zfsonlinux/zfs-auto-snapshot". GitHub. Retrieved 18 March 2018. ^ "[GUIDE] Windows Previous Versions and Samba (Btrfs - Atomic COW - Volume Shadow Copy)". openmediavault. ^ "How restore points and other recovery features in Windows Vista are affected when you dual-boot with Windows XP". File Cabinet Blog. Microsoft. 14 July 2006. Retrieved 21 March 2007. ^ "Calling SRSetRestorePoint". MSDN Library. Microsoft. Retrieved 1 February 2015. Snapshots of the boot volume created by System Restore running on Windows 8 may be deleted if the snapshot is subsequently exposed by an earlier version of Windows. Russinovich, Mark E.; Solomon, David A.; Ionescu, Alex (2009). "Storage Management". Windows Internals (5th ed.). Microsoft Press. pp. 688–698. ISBN 978-0-7356-2530-3. "Selected Scenarios for Maintaining Data Integrity with Windows Vista". Microsoft TechNet. Microsoft Corporation. Retrieved 4 January 2011. Russinovich, Mark; Solomon, David (December 2001). "Windows XP: Kernel Improvements Create a More Robust, Powerful, and Scalable OS". TechNet Magazine. Microsoft. Retrieved 2 May 2013. Oltean, Adi (19 September 2006). "A bit of black magic: How to assign drive letters to VSS shadow copies... on Windows XP!". Antimail. Microsoft Corporation. Retrieved 4 January 2011. Oltean, Adi (14 December 2004). "Creating shadow copies from the commandline". MSDN Blogs. Microsoft Corporation. Retrieved 4 January 2011. "Volume Shadow Copy Service (VSS) Express Writers". Microsoft Corporation.